The scene of the crash on the N20 Cork - Mallow road near to the slip road to Waterloo where James Baker and Peggy Sue Adams lost their lives Picture: John Delea. 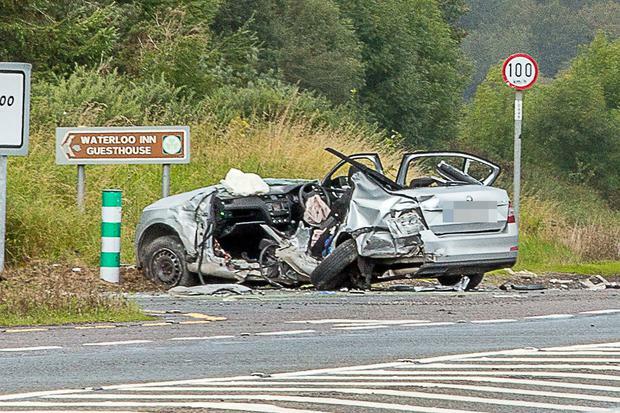 NEW signage is to be erected at a notorious road junction near a famous Irish tourist landmark where two US tourists were killed and three others injured in two horrific accidents in just eight months. The safety signs will be erected at the Waterloo junction on the N20 Cork-Limerick road near a turn-off for Blarney Castle. The decision to erect the new signage came after a crash last month in which US tourist Danny Dinehart was seriously injured in a head-on collision. James Baker (62) from Indiana, another US tourist, was killed at the same Waterloo junction last September alongside Peggy Sue Adams. Two other US tourists were also seriously injured in that collision. Mr Baker's daughter, Diana, had called for safety measures to be taken in hand at the roadway. Judy Dinehart was injured alongside her husband, Danny, in a head-on collision at the same junction last month and said she will never forget paramedics telling each other in relief as they treated her husband: "We have a pulse, we have a pulse." Her husband suffered a serious head injury. He has been treated by neurological specialists for a brain injury. "But he has been making progress and, if he keeps up his progress, we may be in a position to go home next week or the week after," she said. Judy has paid tribute to the dedication and kindness of staff at Cork University Hospital (CUH) where her husband has been treated. However, she admitted she was shocked when she learned their accident was not the first to occur at the junction. Safety campaigners have been calling for signs to be erected urging people to travel a further 2km to take a much safer turn-off for Blarney off the N20. Judy and Danny were in Ireland for a two week holiday and were using a SatNav system. It had indicated they should turn-off for Blarney Castle at the junction - despite the fact a second but much safer turn-off was only a short distance further down the road. While turns are possible at the junction, motorists then have to cross two lanes of oncoming traffic. The new signage will advise people to use the second, safer turn-off a short distance further on.